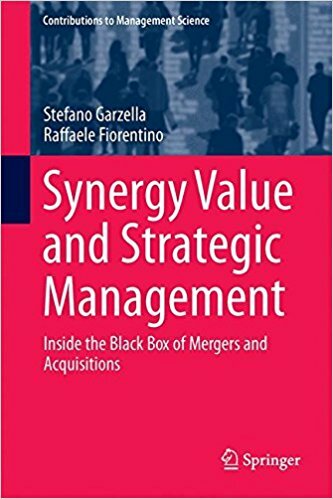 This book addresses synergy management, which poses an important challenge for firms, advisors and practitioners involved in mergers and acquisitions (M&A). Synergy plays a key role in M&A contexts, both in the decision-making process and, subsequently, in the integration phase. However, despite the fact that synergy value is commonly regarded as one of the key success factors in M&A, research shows that firms generally fail to achieve the expected synergy. The extant literature is characterized by a lack of comprehensive models of synergy management: the assessment of synergy value remains a “black box” for scholars and practitioners alike. The authors provide a comprehensive framework for synergy management by integrating findings from prior research and various disciplines. The framework highlights the main dimensions of synergy management in mergers and acquisitions, common pitfalls, and new models and tools for avoiding them. As such, the book enriches the M&A literature, offers new insights for scholars, and provides valuable guidelines for practitioners involved in synergy management.